Rev. 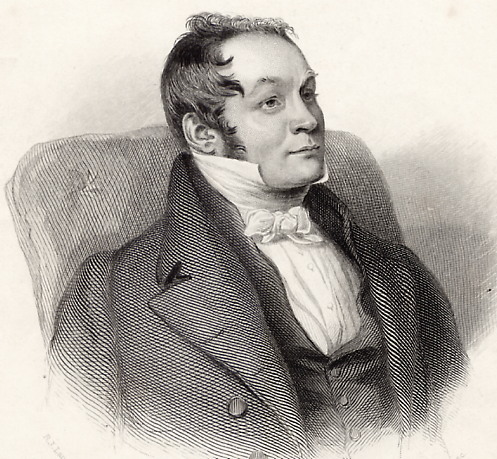 Richard Harris Barham ~ The "Thomas Ingoldsby" of literature was born at Canterbury, December 6th 1788. His family had long been residents in the archiepiscopal city, and had estates in Kent. He used to trace his descent from a knight who came over to England with William the Conqueror, and whose son, Reginald Fiturse, was one of the assassins of Thomas a' Becket (see above). Part of the family estate included a manor called Tappington Wood, often alluded to in the Ingoldsby Legends. 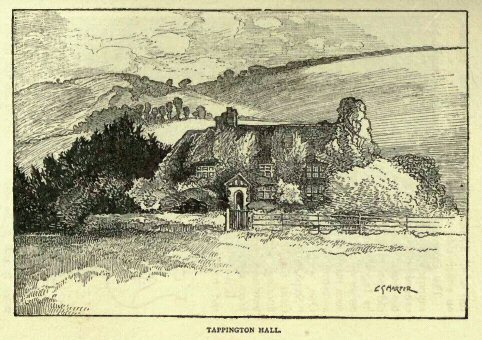 One of the most famous stories being "The Spectre of Tappington", which mentions Denton and of course Tappington Hall itself (referred to as Tappington Everard). Charles G. Harper, author of "The Brighton Road," "The Bath Road," in his book, "The Ingoldsby Country," points out the literary landmarks of the "Ingoldsby Legends," by "Tom Ingoldsby," the Rev. Richard Harris Barham. 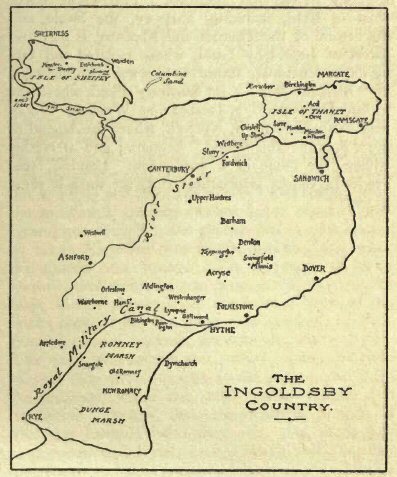 The latter was born at Canterbury, the capital of the Ingoldsby country, which he created with his legends. The 'Ingoldsby Legends' by R.H. Barham, were the first burlesque and horror tales in verse in the English language. Their creator was a clergyman of Kentish origin whose lifestyle and character was at times equally unusual. 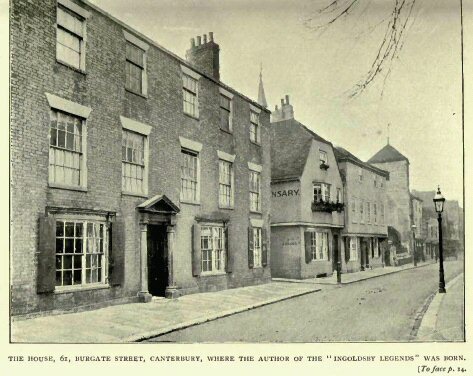 Richard Harris Barham was born at 61 Burgate, Canterbury, on 6th December 1788. 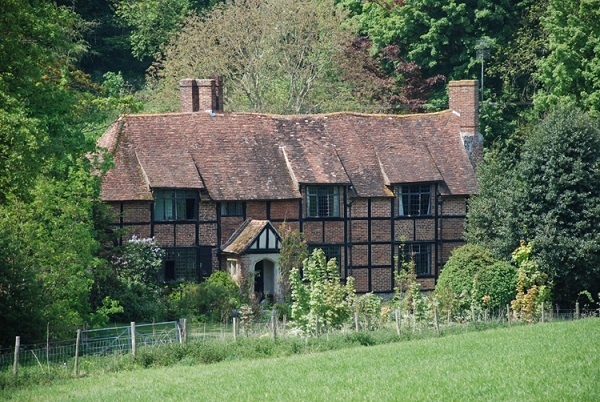 His was an old Kent family that claimed descent from the De Bearhams, anciently the FitzUrses, one being a knight involved in the murder of Becket who, having fled to Ireland, left his manor of Barham to a brother who changed the family name to De Bearham which in time dropped the De and was corrupted to Barham. At some time the manor had passed out of the Barham family but eventually returned. A Colonel Thomas Marsh sold it to Thomas Harris, Canterbury hop-factor, the latter dying in 1729. Harris' only child, a daughter and heiress, married a John Barham. The Rev. Richard Harris Barham of 'Ingoldsby' fame was fourth in descent from John Barham. His own father, also a Richard Harris Barham, was a Canterbury alderman and mayor and inherited the Burgate property from his father Richard Barham in 1784. 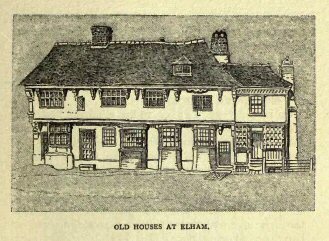 Alderman Barham was enormously fat, weighing 19 stone, though one source says 'seven and twenty stone before he was 48', but he formed a relationship with his housekeeper, Elizabeth Fox, of Minster-inThanet, the result being the birth of their only child, Richard Harris Barham, four years after they moved into the Burgate house. The child was baptised nearby at St Mary Magdalene church, Burgate. Barham's father died in 1795 and was interred at Upper Hardres. 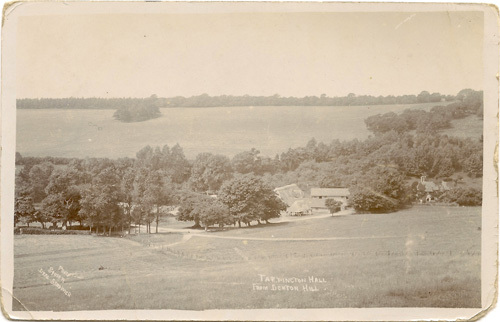 His son, at the early age of seven, thus inherited the Manor of Tappington Everard, near Denton. Richard Harris Barham, the younger, began his education at Canterbury, but, being fatherless, he was sent aged nine to St Paul's School, in the Precincts of that Cathedral. At St Paul's School he was a friend of Richard Bentley, later to be his publisher. While returning there in 1802 he had been involved in a coach accident that was almost fatal for him, but recovered although his right arm was permanently crippled. Barham later described himself at this age as 'a fat little punchy concern', a description that fitted him for life, too, as he remained a short person, broad and deep-chested. He went to Oxford in 1807, where he achieved his B.A. degree in law after a somewhat wild, extravagant undergraduate life including heavy gambling losses. A guardian, Lord Rokeby of Monk's Horton, refused to pay these debts, but gave Barham the money as a friend the sum he would not lend. This so impressed Barham that he changed his way of life and returned to his Burgate property. 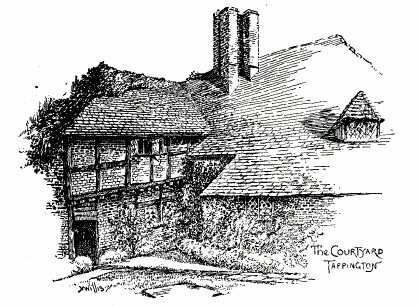 There he founded the convivial Wig Club, whose members held burlesque debates in the summerhouse of the high-walled garden fronting Canterbury Lane and even paraded in fancy costume along Burgate. In 1813 Barham's mother died. He also endured a serious illness. During this his views on his future changed. Instead of the law he decided to enter the ministry and was ordained that year. In 1814, on being appointed curate of Westwell, he married Caroline Smart, daughter of a captain in the Royal Engineers. The Archbishop of Canterbury presented him with the living of Snargate and curacy of Warehorne in 1817. Far from being disillusioned at this appointment to an isolated Romney parish it suited him admirably. Many of his parishioners were smugglers by night, who, when there was a 'run' of goods, commandeered his church belfry to stow them. Perhaps some came his way for 'turning a blind eye' to such occurrences. While at Snargate he had a gig accident and broke a leg that confined him to home. To pass the time he wrote his first novel 'Baldwin', published 1820, but it was not successful. Undaunted he began another, 'My Cousin Nicholas', but in 1821, elected a Minor Canon of St Paul's Cathedral, he left Romney Marsh for London with his wife and three children. In 1824 he was presented with the living of St Mary Madalene and St Gregory By St Paul's, and made Priest in Ordinary to the Chapels Royal. He now found time to write topical and religious articles and poetry for various publications. This brought him into contact with literary people, including a Mrs Hughes, grandmother of Thomas Hughes, author of 'Tom Brown's Schooldays', the result of which being that he finished 'My Cousin Nicholas', published in parts in 1834 by Blackwoods's Magazine. As a book it was not a great success: Barham found it difficult to sustain novel writing although he wrote verse with ease. Probably 'Ingoldsby Legends' would never have been created either but for his desire to help his old school friend Richard Bentley who was to publish the first issue of 'Bentley's Miscellany' in January 1837, edited by Charles Dickens. Bentley persuaded him to contribute to it. Mrs Hughes was also involved in launching what became the 'Legends'. She was a mine of ghost stories, folklore, mysteries and topographical traditions of all kinds which Barham revelled in hearing her relate. She gave some of her themes to Barham to put into verse, as he freely admitted: 'Give me a story to tell and I can tell it in my own way but I cannot invent one'. 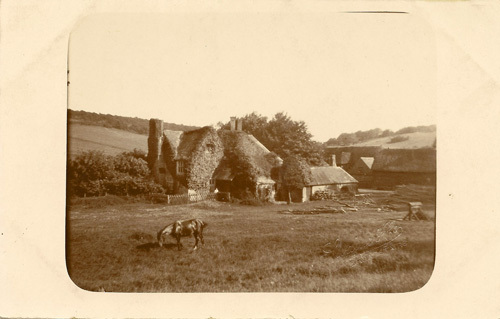 She also advised him to use some of the suitable examples from his Kentish background and the county. The 'Ingoldsby Legends' were published periodically in 'Bentley's Miscellany'. The first was 'The Spectre of Tappington' in January 1837, under the pen-name 'Thomas Ingoldsby' in case it was thought unseemly for a Minor Canon of St Paul's to be the creator of such verses. Readers became curious about 'Thomas Ingoldsby'. They wanted to know where he lived; did he visit London, if so, when, so readers and literary men could meet the 'Legends" creator. Dickens as editor was pestered with enquiries and replied he knew nothing of 'Mr Ingoldsby' who, he believed, only Mr Bentley had ever met. Dickens was certain, too, that Mr Ingoldsby was a shy, retiring man and he had made an arrangement that Mr Ingoldsby's 'copy' of the verses went straight to the printer, so the editor never saw it. Was this not unusual, he was asked, but Dickens replied that as everyone knew Mr Bentley had his own way of doing things. After their success in the magazine it was decided in 1840 by Bentley to collect some of the verses as a book, 'The Ingoldsby Legends by Thomas Ingoldsby'. This was a success. Then the truth came out. 'Thomas Ingoldsby' was none other than the Rev. Richard Harris Barham, but whatever embarrassment and unease he feared with the Church did not materialise; the opposite was the case and he was soon enjoying fame. A second edition appeared in 1843 and a second series had been added to the original edition in 1842, while a third series being added to the first and second series, all in one volume, was issued in 1847, introduced by his son, Rev. R.H. Dalton Barham, who died at Dawlish in 1886. The Tudor staircase, with its carved oak balustrade and mould handrail, has a newel post on which is carved the reputed merchants' mark of Thomas Marsh of Marston in Barham's 'The Leech of Folkestone'. One night during the Civil War a fratricide was supposedly committed on this staircase, from two rival brothers, descendants of Marsh, one a Royalist, the other Puritan, living in separate parts of the house, met on the stairs. The Puritan, full of hatred, on passing his brother attacked him with an axe and killed him. Mrs Jane Clough, the present owner, pointed out to me the indentation on the rail said to have been caused by an axe blow that missed its target, while one of the balusters also has a piece struck from its base. No bloodstains are now in evidence on the stairs or the landing near what is known as the bedroom of 'Bad Sir Giles' who murdered a guest, described in 'The Spectre of Tappington'. Writing in his 'Ingoldsby Country' (A. & C. Black, 1906) Charles G. Harper stated that in 1904 he could still see the bloodstained topmost stair and flooring, but Charles Igglesden, Vol.26, 'Saunters Through Kent', on a visit in 1932 said the 'ineradicable' bloodstains could no longer be seen. Around the frieze of the hall there are small armorial shields of the 'Ingoldsby family', but, as Igglesden said, they are 'a quaint hoax'. Visitors for many years came to see the ancestral home of the 'Ingoldsbys' and went away confused. Barham, in an attempt to convince the incredulous concerning his 'Legends' and Tappington Everard wrote: 'Let them take the high road from Canterbury to Dover till they reach the eastern extremity of Barham Downs. Here a beautiful green lane diverging abruptly to the right will carry them through the Oxenden plantations and the unpretending village of Denton, to the foot of a respectable hill ... On reaching its summit let them look straight before them ... among the hanging woods which crown the opposite side of the valley ... an antiquated manor-house of Elizabethan architecture, with its gable ends, stone stanchions and tortuous chimneys rising above the surrounding trees ... proceeding some five or six furlongs through the avenue, will ring at the lodge-gate, they cannot mistake the stone lion with the Ingoldsby escutcheon in his paws � they will be received with a hearty old English welcome.' But no such building existed; no lodge-gate, no stone lion, or avenue to Tappington. His description was writer's licence on Barham's part, a combination of various buildings and scenes known to him. Nearby Broome Park mansion and its 'eagle gates were the originals in Barham's text and Gilks' woodcut 'Tappington Taken From the Folkestone Road'. Barham widely used the names of ancestral relatives, his friends and other people in his work, plus the legends and traditions of Kent and many sites in the county, too, several being set at Tappington itself; examples 'The Ingoldsby Penance' and 'The Witches' Frolic' which also refers to 'my little boy Ned'. Canterbury Cathedral features in 'Nell Cook, a Legend of the Dark Entry'. 'Misadventures at Margate' concerns that resort. 'Smugglers Leap �Legend of Thanet' refers to villages in the area, a chalkpit near Acol and an Exciseman, Anthony Gill, who lost his life there in the 18th century. Another is 'The Old Woman in Grey, a Legend of Dover', also 'Grey Dolphin, a Legend of Sheppey', referring to Robert de Shurland and his horse. Studying them again the reader soon realises Barham's verses on these subjects are what I would call 'semi-fiction'. But to return to Barham's life. In June 1840, he received a shock from which he never recovered � the death of his youngest, favourite son, his 'little boy Ned' at the age of twelve. This was followed by the sudden death of a lifelong friend, Theodore Hook, another practical joker and novelist. Barham attended the opening of the Royal Exchange in 1844, caught a cold, which he neglected, so it developed into his 'fatal illness'. At his home in Amen Corner, Paternoster Row, London, he jocularly remarked this was appropriate due to its name and his end being nigh. As he lay in bed he managed to reflect his feelings in a last poem 'As I lave a-thynkyne' written a few days before he died on 17th June 1845, aged 56, having already 'made careful disposition of everything � even the cats'. He was interred in a vault in St Mary Magdalene, Old Fish Street Hill, but after a fire in 1886 destroyed the church his remains were re-interred in Kensal Green Cemetery. On 25th September 1930, a memorial service was held at the Guildhall, Canterbury, at which a memorial bronze to Barham was unveiled by the Rev. W.R. Inge, Dean of St Paul's. During the Second World War Barham's birthplace, 61 Burgate, was destroyed by German bombing and for a time the bronze plaque was lost, but later re-discovered. A modern shop now stands on the site and on a wall of it his birthplace is again commemorated by the plaque depicting a bust portrait of Barham with the wording underneath: 'Rev. Richard Harris Barham, B.A., author of Ingoldsby Legends, son of Alderman Barham, Mayor of Canterbury, born here December 6, 1788. A humorist, a poet, a genealogist, an antiquary, a clergyman, greatly beloved. This tablet was unveiled by the Very Rev. W.R. Inge, Dean of St Paul's, 1930. Down in one valley you can see a beautiful old homestead �it cannot escape your eye, for there it stands quite by itself, save the barns, cattle sheds and the farm buildings that partly surround it. And out of the midst rise noble trees of great height, with long spreading branches sheltering the stock in farmyard as well as those which, having grazed in the fields, rest in the shaded coolness. For out on the slopes are the cattle and the sheep of the typical yeoman who is now the tenant of Tappington Hall, Mr. F. P. King..
Tappington Hall? Yes, my dear readers, those who know and love Ingoldsby Legends will of course remember Barham's verses built up around this cherished spot. For he lived here. and other members of his family, too, for it was the seat of the Barhams-two branches of them. The famous Reverend Richard Harris Barham was the son of the portly Canterbury alderman of that name, whose girth was so great that he could never sit in an ordinary armchair, and when he died the doorway of his house was of necessity enlarged so as to allow the coffin to come forth. 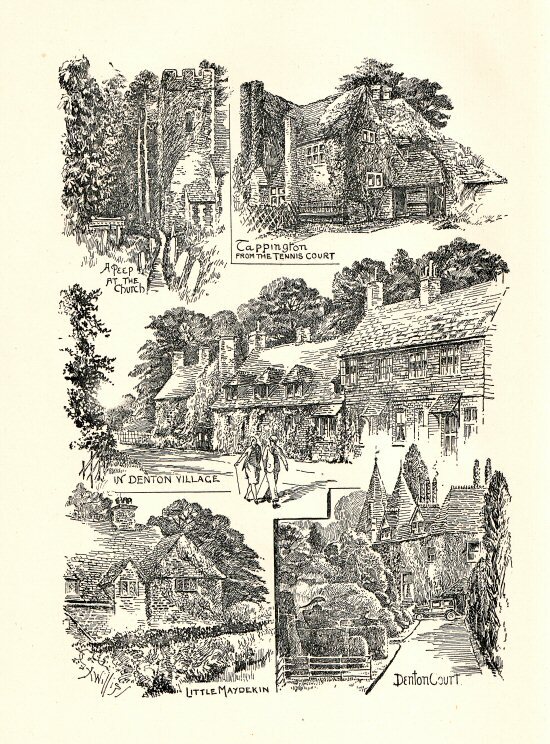 Tappington was mentioned as far back as the days when Domesday was compiled--over eight hundred years ago�but it was then known as 'Tupton and subsequently as Tappington Everard. The present building, built on the site of an earlier one, was erected in Tudor times, although it is not as large as its predecessor, and it has been altered since then. This earlier manor house must have extended a long way, as its foundations can even now be found underground. A well still stands a few yards to the rear of the house, and as wells were enclosed in days gone by for fear of contamination by ruthless enemies it is pretty well certain that the courtyard extended far enough to embrace the well within the domain. During the advance of Cromwell's Roundheads through Kent they visited Tappington, and the owner, a Loyalist, escaped. His wife and servants underwent a severe examination but declined to divulge anything they might have known, and it is recorded that the Roundheads departed after soundly thrashing two farm hands and emptying the larder of every morsel of food. I wonder if the Loyalist was secreted all the time in a hidden cupboard under the landing, which afterwards became the scene of a terrible tragedy. If the old homestead looks conspicuously beautiful as we glimpse it from the main road, its front opens up to an additional charm as we go down the roadway�just a grass tract with ruts for the wheels of carriage or car�for it is so truly rural, with no big drive and not even a roadway in front of it or behind it. The visitor leaves his car in a corner close by the farmyard and walks across the meadow to the little wooden gate that gives entrance to the garden, which is enclosed by an attractive latticed fence. And what an old-world garden ! And then, behind are the mellowed brick walls and windows wreathed in a wealth of ivy and creeper roses, sheltered from above by a long and slightly undulating roof, whose timber frames have warped. The deep-tinted tiles, almost golden when the sun shines on their mossy surfaces, try to show themselves through the masses of ivy with tendrils penetrating under the eaves and up the chimneys. This ivy, brutal in its power, has conquered all but the roses which cluster and grow in front of the house. Ivy in masses, and if you removed it I wonder whether the roof would come, too. 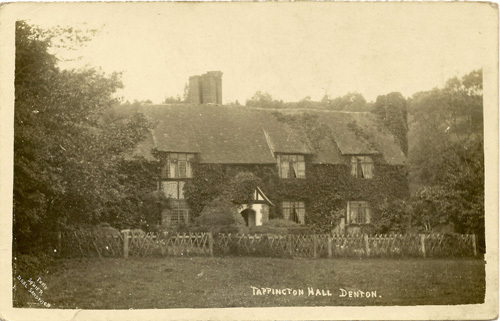 Tappington Hall is to-day composed of many roofs, and yet happily blending' with each other, and this shows that the interior must have been altered since it was constructed in the early part of the seventeenth century, and the filling of the frame was of red brick. From the centre rises a stack with four separate chimneys, and another original chimney stands at one end. The three windows in -the front of the house are half dormers with uncommon sloping roofs, and, like those below them, are latticed. What a difference does the retention of latticed windows make to the appearance of a Tudor house ! At the back of the house are several mullioned windows. But the most artistic spot of all is to be found in a small courtyard at the back, into which you can peer from tiny windows protected by a long timbered cave which has become slanting with age. It must not be forgotten that most of the treasured ancient glass remains in nearly all the windows of the house, and are, therefore, effective in appearance, if not as transparent as those endowed with modern glass. The little gabled porch has mullioned windows, but what astonished me most was to see bees flying out of a deep hole ire wall by the side of the porch. Mr. King tells me that a bee-hive has thrived in this spot several summers, and the only thing to assume is that, far away under the roof, the bees have made excavations and here they store their honey year after year. The original front door- the Tudor porch is practically intact, studded with square-headed nails and deeply-carved panels�a wondrous piece of workmanship. The front of the house was at the present back, and it is the original hall and the hall of to-day that possesses a treasure to be proud of and, happily, well preserved. It is a Tudor staircase in carved oak extending to the upper storey, and in the deeply-moulded newels are the old holes in which candles could be inserted. The balustrade has moulded handrails. This spot marks a terrible tragedy dating back to the troubles when families were divided over the rights of Cromwell and Charles. Two brothers living at Tappington were divided between the two factions�Loyalists and adherents of Oliver Cromwell�but continued to live in the same house, each shutting himself away from the other in separate apartments. By that time the Civil War was over, but the same feeling prevailed and they never spoke. But one night, when going to bed, they happened to meet on the stairs. Bursting with anger and fanaticism, the Puritan could not resist his opportunity. Turning suddenly, he attacked his brother with an axe and killed him. An indentation on the balustrade is said to have been caused by the first ineffectual blow of the axe. Another owner of the house was known as " Bad Sir Giles," and the ghost of one of his victims, the young daughter of his gamekeeper, is said to haunt the coppice not far away. Into this wood he enticed the maiden, and only her ghost was ever seen again. Barham makes much of another tragic story connected with Sir Giles, who murdered a guest as he lay in bed one night. One of the bedrooms is still called " Bad Sir Giles' " room, and at one time stains on the landing were shown, stains from the blood of the murdered man as it trickled under the door to the floor outside. I asked Mr. King, the present tenant, if he had ever seen either of the ghosts�of the Cavalier, the gamekeeper's daughter or the unknown guest�and he merely smiled. " You certainly ought to have one ghost, if not all three," I said. Again he smiled, and said, " We can't have all you want." He could not even show me the bloodstains on stairs and landing. Here is a further legendary tragedy, this time connected with a cupboard under the landing, where, it is said, a boy was confined and died there. Tradition tells us that he was the unwanted child of a lady standing high in the world of society and was hidden in Tappington Hall, and there met his death�murdered, some suggest. Here again is a tale that in itself might be a fitting background to a ghost story, but, alas ! no one can ever see a ghost in these old homesteads nowadays. 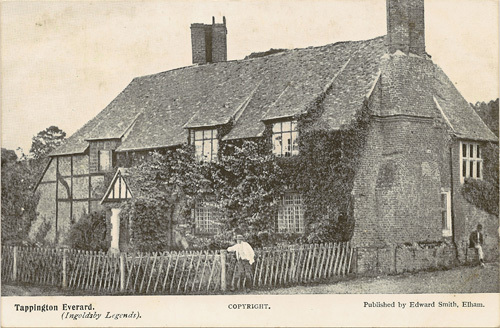 There is a hole in the wall of the dining-room that is said to have been a priest's hiding-place, but nearly every residence boasted of a cavity in the walls somewhere, for were not contraband spirits and silk being continually brought this way from the coast of Kent? In the December 2002 Suzi Perry and the Treasure Hunt Team dropped in to Tappington Hall. The helicopter heads north, following the A260 Canterbury road (the road to Durovernum) to the village of Denton (a small dent on) and over the temporary studio in Broome Park. Dermot walks to the window and waves to Suzi as she flies overhead. English humourist Rev Richard Harris Barham, who was born in Canterbury, wrote �Ingoldsby Legends� (Barham�s booked it in gold) which featured nearby Tappington Hall. The clue is on the staircase under a notch in the stair rail (Mark to flight). Suzi flies north again in the direction the village of Patrixbourne (where Patrick�s born). Count Louis Zborowski lived in nearby Higham Park Hall (where Louis lived) and built three three aero-engined cars, all called �Chitty Chitty Bang Bang� (�your fine four-fendered friend� in the film title song). One of the Chittys is waiting outside. After looking under the car�s bonnet, Suzi finds the clue under the hat (bonnet) of the car�s current owner. The extract and images above are from Martin Underwood's Treasure Hunt website.